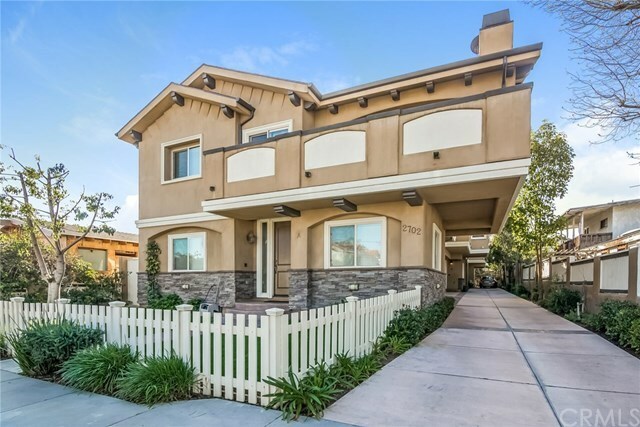 Built in 2010, this approximately 1,800 square foot, four bedroom, three bath townhome features all the upgraded amenities you are looking for. Offering a reverse floorplan, youâll love the open feeling ideal for entertaining. With vaulted ceilings on the main level, youâll love the kitchen featuring stainless steel GE appliances, marble counter tops, and how it opens to the dining and large living room. Stunning distressed Hickory hardwood floors flow throughout. There is a private balcony off the living room with turf grass giving. The roomy master bedroom and bath offer a walk-in closet, door to patio, roomy shower, soaking spa tub and more. There are two bedrooms upstairs and two bedrooms downstairs. Low HOA dues! This is an ideal home with easy freeway access and located in award winning Redondo Beach School District. Directions: West of Inglewood. North of Artesia.